Policy will become clearer when the Defense Department completes its Nuclear Posture Review by early 2018. President Donald Trump has made a number of sometimes contradictory comments related to nuclear weapons during his political campaign and since his election. Most recently, Trump denied an NBC News report that he told his national security advisers during a July meeting that he wanted what would amount to a tenfold increase in the number of U.S. nuclear weapons, returning to Cold War levels.4 “I want modernization and I want total rehabilitation” so the current arsenal is “in tip-top shape,”5 he told reporters October 11 at the White House, suggesting he will continue or accelerate the nuclear stockpile management program begun during the previous administration. All that has created some uncertainty about how U.S. nuclear policies will change with a new administration led by a president who took office without experience in foreign policy or strategic thinking, let alone the complexities of nuclear weapons and deterrence. How his views and the changing strategic environment may alter the direction of U.S. nuclear policy will become clearer when the Department of Defense completes its Nuclear Posture Review (NPR), expected late this year or in early 2018. Posture reviews have been completed by three presidents since 1994 and have proven to be consequential documents. Much of the work and details behind the policies are classified, although it is expected that an unclassified NPR Report will be made public, affecting how the United States, its president, and its nuclear capabilities are seen by allies and adversaries alike. More importantly, the review establishes a guide for decisions that underpin the management, maintenance, and modernization of the nuclear arsenal and influences how Congress views and funds the nuclear forces. One critical element of past nuclear posture reviews and likely this one as well is context. The first, completed under President Bill Clinton, was needed to define the purpose and possible role of nuclear weapons in the wake of the Soviet Union’s collapse. The resulting “lead but hedge” strategy provided a continuing rationale for nuclear weapons and sought to preserve capabilities against a future Russian threat. The George W. Bush administration was seized with the challenge of addressing proliferation by countries such as North Korea and Iran and focused on the inability of the United States to hold deep underground targets at risk. This led to the pursuit of new nuclear capabilities, such as the Robust Nuclear Earth Penetrator, that implied use as a battlefield weapon, not just a deterrent against attack on the United States or its allies. When combined with the global war on terrorism and the reliance on using U.S. military forces for regime change, the Bush administration was seen as much more reliant on nuclear weapons than the actual policy record reflects. The Nuclear Posture Review (NPR) Report prioritized measures to strengthen nonproliferation efforts and to accelerate the securing of nuclear materials worldwide. “As a critical element of our effort to move toward a world free of nuclear weapons, the United States will lead expanded international efforts to rebuild and strengthen the global nuclear nonproliferation regime—and for the first time, the 2010 NPR places this priority atop the U.S. nuclear agenda,” the report stated. The United States will continue to strengthen conventional capabilities and reduce the role of nuclear weapons in deterring non-nuclear attacks. The United States is “not prepared at the present time to adopt a universal policy that the ‘sole purpose’ of U.S. nuclear weapons is to deter nuclear attack on the United States and our allies and partners, but will work to establish conditions under which such a policy could be safely adopted,” the report stated. The U.S. nuclear triad will be maintained under the New Strategic Arms Reduction Treaty (New START). The report states that the treaty does not constrain U.S. missile defenses and allows the United States to pursue conventional global strike systems. All U.S. intercontinental ballistic missiles having multiple warheads will be restructured to having a single warhead each to increase stability. The United States will pursue post-New START arms control with Russia that addresses not only strategic weapons, but also nonstrategic and nondeployed nuclear weapons, the report said. Nuclear forces will “play an essential role in deterring potential adversaries and reassuring allies and partners around the world,” the report said. The United States will retain the capability to forward-deploy U.S. nuclear weapons on tactical fighter-bombers and heavy bombers. The administration is pursuing a comprehensive approach to broaden regional security architectures, including through missile defenses and improved conventional forces, the report said. The United States will modernize its nuclear weapons infrastructure and sustain the science, technology, and engineering base. The United States will not develop new nuclear warheads and will not support new military missions or provide for new military capabilities, the report said. The United States will not resume nuclear testing and will seek ratification and entry into force of the Comprehensive Test Ban Treaty. President Barack Obama came into office at a time when the United States was seen internationally as a threat to the global nonproliferation and disarmament regime it had helped over decades to create and support. The previous administration’s false weapons of mass destruction (WMD) justification for the invasion of Iraq, Bush’s pursuit of the earth-penetrating warhead and a series of new “reliable replacement warheads” and that adminstration’s broader pursuit of regime change as a nonproliferation tool had reduced the credibility of the United States as a nonproliferation leader and a responsible nuclear-weapon state. This perception was part of the context for Obama’s NPR. He and his national security team saw restoring U.S. leadership of the global nonproliferation and disarmament effort as critical to addressing two dominant threats: nuclear proliferation and nuclear terrorism. Historians will establish whether this emphasis was well placed, but there is no question about the motivation of the Obama team. The president’s Prague speech in 2009 set the frame that was filled in by the NPR Report, released in 2010.6 The speech sought to balance the U.S. recommitment to eventually achieving the peace and security of a “world without nuclear weapons”—a U.S. goal dating back to the creation of such weapons—with the need to maintain at present a safe, secure, and effective nuclear arsenal for the security of the United States and that of its treaty allies. Furthermore, it directly recognized that the objectives of nonproliferation and preventing nuclear terrorism need to influence how the United States manages its nuclear arsenal. First and foremost in the minds of decision-makers was the pressing nuclear challenge of Iran, and the U.S. recommitment to disarmament was key to convincing states to apply the pressure on Iran needed to negotiate a nuclear agreement and avert a new war in the Middle East. The Trump administration is now developing its nuclear policy and must wrestle with new challenges. Because of the president’s statements and unorthodox behavior, the context for this administration is already negative and likely to get worse. Bombastic and inflammatory statements by Trump toward North Korea and his decision not to certify Iran’s compliance with the nuclear deal, known formally as the Joint Comprehensive Plan of Action, cement a public view that the administration is willing to take greater risks than its predecessors with nuclear weapons and potential nuclear conflicts. Thus, the Trump NPR is being produced in an environment where the president is seen as less responsible and cautious with nuclear threats than any president since Ronald Reagan in his first term. Key to any posture review is a set of questions from which answers help to justify a set of programs, either new or carried over from past work. Central to any review are two key and interrelated questions: Why does the United States need nuclear weapons, and under what circumstances would the president consider using them to protect U.S. interests? It would be a remarkable break with long-standing U.S. policy were the Trump vision for the possible use of nuclear weapons to diverge from this concept, but the ways in which a president pursues these goals can and has been quite different. The Trump team likely will seek more robust language to bolster the perceived willingness of the United States to use nuclear weapons. The president seems less concerned about how such statements may undermine U.S. nonproliferation policies and global standing and thus likely to put more weight on the need for stronger statements justifying the potential use of nuclear weapons and their continued development and possession. The review is expected to move away from the Obama administration’s approach in a number of ways but to retain some continuity as well. Although it is impossible at this point to predict the precise tone or language, some issues are expected to emerge. U.S. nuclear weapons were designed in the 1970s and built in the 1980s and 1990s. Almost all are undergoing or will soon undergo what are known as life extension programs (LEPs). Congress has provided funding for these programs, and initial Trump budgets have shown strong support for these as well. Some of these LEPs involve minor updates and refurbishment, and some are complete renovations of existing weapons inside old containers. All result in weapons that are safe and reliable and can be expected to remain so for many decades. Yet, there are growing concerns among some in the policy and technical communities that the age of U.S. weapons impose an excessive cost and has strategic implications. The worry is that, as these weapons age, Russia or some other adversary may see them as less reliable and that perception will make U.S. defense commitments to allies more difficult to fulfill. If this is the case, producing new weapons would provide a greater deterrent effect vis-á-vis Russia and others and be more reassuring to allies. There is no evidence to back up this argument, but it also cannot be disproven. Since the United States conducted its last underground nuclear test explosion in 1992, the U.S. national laboratories have certified that their science-based stewardship programs have been able to ensure that U.S. nuclear weapons remain safe, secure, and effective. At the same time, the laboratories responsible for designing and maintaining nuclear weapons have struggled to attract and retain the necessary experts, often competing with Silicon Valley, and have argued that enabling scientists to design new weapons or at least conduct new weapons research would be helpful to maintaining a range of nuclear capacities. These arguments have been around for a long time, ever since the end of the Cold War. Under Obama, because there was not a need to pursue the development of new weapons to ensure the nuclear deterrent, technical interest in some quarters to design and develop new weapons was not seen as a priority. Unbound by such considerations, as evidenced by Trump’s statements that if there is to be an arms race, let there be an arms race,8 the new NPR may authorize the laboratories to undertake design work on new weapons, possibly even for new missions. For U.S. deterrent and nuclear reassurance statements to be credible, allies and potential adversaries must believe that the United States is prepared to use its nuclear weapons to deny an adversary the objective it seeks or to raise the costs of achieving that objective to the point where it is unappealing. Some experts and analysts, including some now in the Trump administration, have maintained that because most but not all U.S. nuclear warheads are quite large by nuclear standards—some 10 to 20 times the size of the weapons dropped on Hiroshima and Nagasaki—they are too large for any threatened use to be credible. Under that argument, an adversary could convince itself that the United States will be self-deterred from using nuclear weapons because of the collateral damage to civilians and the environment. If that is seen as a problem, the solution proposed by some is U.S. development of smaller, more usable nuclear weapons.9 Options include development of a new tactical nuclear weapon or modifications to existing strategic weapons that would produce a much smaller detonation than they were originally designed to produce. The prospect that Trump would support the development of such weapons is uncertain, but may be included at least as an aspiration in the NPR. To be clear, there is no evidence from direct engagement with U.S. allies or countries such as Russia or China that proves or even strongly indicates that the size of U.S. nuclear weapons is seen as undermining U.S. deterrence or reassurance commitments. For the most part, this is a debate inside the U.S. nuclear security and military community that worries that a president might be self-deterred from using nuclear weapons for fear of collateral damage or other legal or moral considerations. It remains to be seen if the Trump NPR will seek such weapons, perhaps using such justification. It is not evident that there is a self-deterrent problem with the U.S. nuclear arsenal that requires a nuclear solution along these lines. Moreover, any such move is likely to replay the alarm during the 2000s that the president is eager to have and possibly employ nuclear weapons, a perception that would weaken strategic stability and undermine U.S. nonproliferation efforts. All indications are that modernizing U.S. nuclear forces remains the Pentagon’s top priority for the NPR. The United States is in early stages of research and development of replacements for its current nuclear arsenal. Most of the delivery systems—land-based missiles, ballistic missile submarines, and long-range aircraft—are nearing the end of their lifecycles. Under Obama, it was decided that the United States would pursue replacements for all three legs of the nuclear triad while investing resources to ensure that the National Nuclear Security Administration (NNSA) and its laboratories, which maintain and monitor U.S. nuclear weapons, have what they need to keep U.S. weapons safe, secure, and effective. As these programs took shape, it became clear that the cost associated with a full-scale modernization of all three legs at the same time was a fiscal challenge, and a debate began about how to cover the costs along with the other demands associated with conventional military modernization. Clearly, the costs associated with the nuclear modernization program are skyrocketing. An original outside estimate that the programs might cost $1 trillion over 30 years now appears to significantly underestimate the costs. The true costs could be 50 to 100 percent higher once all associated cost increases and programs are included. There is no way these programs will be sustainable if buying them means the U.S. military cannot also afford new fighter aircraft, surface ships, and advanced conventional capabilities needed to support broad U.S. defense requirements. Thus, one issue the NPR needs to address is the intersection of policy requirements and budget resources. It would be the height of irresponsibility for the administration to call for continuing or expanding nuclear programs without explaining how these costs will be covered. Many options to adjust the pace and composition of future nuclear forces exist and need to be evaluated. These include delaying some programs, such as the new Ground-Based Strategic Deterrent designed to replace the Minuteman III intercontinental ballistic missiles, while possibly eliminating others. One prime candidate for elimination is the nuclear long-range standoff cruise missile.10 The NPR likely will not end or slow down these programs. In fact, it is possible the NPR will seek to accelerate their development. Yet, it will be critical that the NPR and Defense Department explain the costs of these programs and how they will be funded in a constrained budget environment. The Obama administration took as a starting point in its review the concept that the United States should continue its tradition of only assigning to nuclear weapons the minimum roles necessary to ensure U.S. security and that of allies. The more that the role of nuclear weapons is reduced, the more credible U.S. strategy becomes and the greater the ability to achieve good security and nonproliferation outcomes. They took the view that to have and retain political and moral leadership in the effort to confront Iran’s nuclear program, it was important to reduce the number and role of nuclear weapons to the lowest level consistent with national security requirements. This was not seen as a favor to any other country or constituency, but rather to ensure that the United States was acting consistently with a desire to reduce the risks of nuclear use and to support the global nonproliferation and disarmament system. These policies focus on two groups of states: those with nuclear weapons and those without nuclear weapons. For those countries with nuclear weapons, the NPR Report stopped short of declaring deterrence as the “sole purpose,” as arms control and disarmament advocates sought. U.S. General Paul Selva, vice chairman of the Joint Chiefs of Staff, told the House Armed Services Committee in March that “our adversaries started to articulate a doctrine of escalation to deescalate, and we have to account for in our nuclear doctrine what that means…as we look at an adversary that expresses in their rhetoric a willingness to use nuclear weapons.”15 Selva is one of the key officials involved in shaping the NPR. For states that do not possess nuclear weapons and are in full compliance with their nuclear nonproliferation obligations, the Obama NPR was very clear. There are no military requirements for the United States to threaten the use of nuclear weapons against any state that does not have nuclear weapons, and threats to do so are arguably less than credible. The NPR Report set out parameters for providing negative security assurances to non-nuclear-weapon states that are party to the nuclear Nonproliferation Treaty and in compliance with their nuclear nonproliferation obligations. [T]he United States affirms that any state eligible for the assurance that uses [chemical or biological weapons] against the United States or its allies and partners would face the prospect of a devastating conventional military response—and that any individuals responsible for the attack, whether national leaders or military commanders, would be held fully accountable. Given the catastrophic potential of biological weapons and the rapid pace of bio-technology development, the United States reserves the right to make any adjustment in the assurance that may be warranted by the evolution and proliferation of the biological weapons threat and U.S. capacities to counter that threat. Having worked to build and maintain the taboo on nuclear use for 70-plus years, the United States has every reason to seek its maintenance. The NPR Report language in this context will be critical, as will be the underlying policy choices. It remains unclear, however, how the NPR will balance traditional U.S. restraint when it comes to nuclear policies and the president’s own thinking and his strong desire to distinguish himself from Obama’s policies on all issues. In the end, Trump will have to determine, drawing on input from his cabinet and national security team, any changes in nuclear weapons policy and how to frame those decisions in communicating to audiences at home and abroad. Some issues are ripe for support from both the left and the right in Congress, such as modernizing existing nuclear forces and ensuring the national laboratories have the skills and resources needed to monitor and keep the weapons safe, secure, and reliable. Others, including pursuit of new nuclear weapons or broadening the conditions under which the president might use nuclear weapons, threatens to make nuclear policy yet another partisan battleground to the detriment of U.S. security policy and nonproliferation aspirations. 1 “Campaign Flashback: Trump’s 2016 Nuclear Weapons Stance,” NBC News, October 6, 2017, https://www.nbcnews.com/video/campaign-flashback-trump-s-2016-nuclear-weapons-stance-1064516163692. 2 Office of the Press Secretary, The White House, “Remarks by President Trump Before a Briefing on the Opioid Crisis,” August 8, 2017, https://www.whitehouse.gov/the-press-office/2017/08/08/remarks-president-trump-briefing-opioid-crisis. 3 David E. Sanger and Maggie Haberman, “Transcript: Donald Trump on NATO, Turkey’s Coup Attempt and the World,” The New York Times, July 21, 2016. 4 Peter Baker and Cecilia Kang, “Trump Threatens NBC Over Nuclear Weapons Report,” The New York Times, October 11, 2017. 5 Office of the Press Secretary, The White House, “Remarks by President Trump and Prime Minister Trudeau of Canada Before Bilateral Meeting,” October 11, 2017, https://www.whitehouse.gov/the-press-office/2017/10/11/remarks-president-trump-and-prime-minister-trudeau-canada-bilateral. 6 Office of the Press Secretary, The White House, “Remarks by President Barack Obama in Prague As Delivered,” April 5, 2009, https://obamawhitehouse.archives.gov/the-press-office/remarks-president-barack-obama-prague-delivered. 7 U.S. Department of Defense, “Nuclear Posture Review Report,” April 2010, https://www.defense.gov/Portals/1/features/defenseReviews/NPR/2010_Nuclear_Posture_Review_Report.pdf (hereinafter NPR Report). 8 “President-Elect Trump Calls for Nuclear Arms Race, Stunning Experts,” NBC News, December 23, 2016, https://www.nbcnews.com/nightly-news/video/president-elect-trump-calls-for-nuclear-arms-race-stunning-experts-840644675837. 9 Bryan Bender, “Trump Review Leans Toward Proposing Mini-Nuke,” Politico, September 9, 2017, http://www.politico.com/story/2017/09/09/trump-reviews-mini-nuke-242513. 10 Secretary of Defense Jim Mattis, who has described himself as undecided about the long-range standoff weapons system, said a decision “will come out of” the NPR. 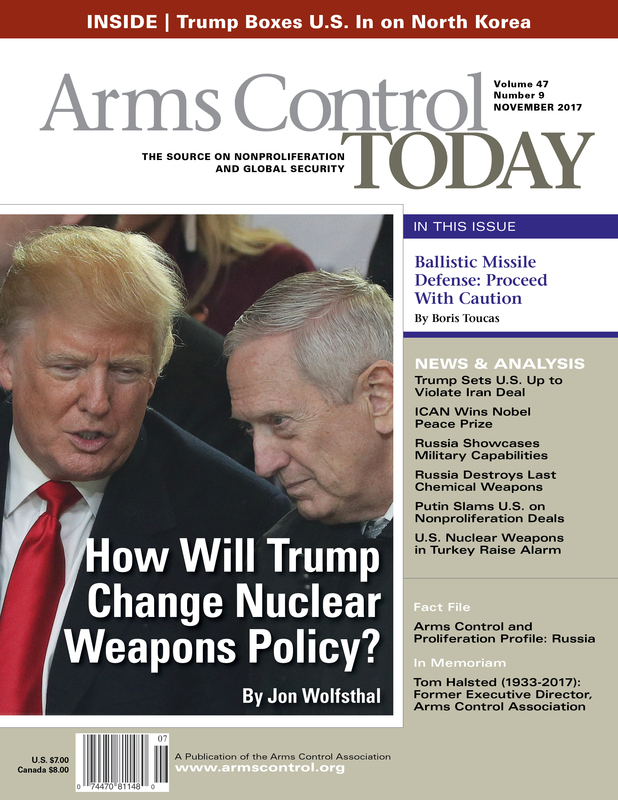 See Kingston Reif, “Air Force Nuclear Programs Advance,” Arms Control Today, October 2017, https://www.armscontrol.org/act/2017-10/news/air-force-nuclear-programs-advance. 11 NPR Report, p. ix. 13 “Donald Trump Won’t Take Nuclear Weapons Off the Table,” Hardball With Chris Matthews, March 30, 2016, http://www.msnbc.com/hardball/watch/donald-trump-won-t-take-nukes-off-the-table-655471171934. 14 Anya Loukianova Fink, “The Evolving Russian Concept of Strategic Deterrence: Risks and Responses,” Arms Control Today, July/August 2017, https://www.armscontrol.org/act/2017-07/features/evolving-russian-concept-strategic-deterrence-risks-responses. 15 Rebecca Kheel, “Pentagon Starts Review of Nuclear Posture Ordered by Trump,” The Hill, April 17, 2017, http://thehill.com/policy/defense/329137-pentagon-official-starts-nuclear-posture-review. 16 NPR Report, p. 16. Jon Wolfsthal served as a special assistant to the president and senior director for arms control and nonproliferation at the National Security Council in the Obama administration from 2014 to 2017. He is now senior adviser to Global Zero and director of the Nuclear Crisis Group. He is also a nonresident scholar at the Carnegie Endowment for International Peace and at the Belfer Center for Science and International Affairs at Harvard University’s Kennedy School of Government. Read more about How Will Trump Change Nuclear Weapons Policy? The envisioned security benefits may be jeopardized if the process is driven primarily by technological advances and business interests and without adequate political vision and consideration of the implications for strategic stability. The ballistic missile defense review underway by the Trump administration may end years of shifting approaches and decisively strengthen programs that have experienced ups and downs since the 1990s. Incrementally, missile defenses, despite current technical limitations, haves acquired a genuine operational dimension for military planners and political leaders. Going forward, technological advances and business interests will make increased spending on such programs appealing, accelerating the development of systems designed to counter advanced offensive arsenals. The missile defense revolution may be taking shape slowly, but it is almost inevitable. The aim is to enhance the overall security of the United States and its allies in a world of increasing ballistic missile threats. Yet, that appealing goal may be jeopardized if the process is driven primarily by technological advances and business interests and without adequate political vision and consideration of the implications for strategic stability. Absent such safeguards, this evolution may lead to increased strategic instability as other countries seek to counter U.S. developments. Alternatively, ensuring meaningful political oversight in the United States and encouraging other countries to join in regulatory efforts would guarantee that the overall security contribution remains positive. After the end of the Cold War, U.S. missile defense, once a divisive topic, gained bipartisan support.1 Although Iraqi and North Korean missile capabilities spurred the development of new defensive systems, the combination of incremental technological progress and Russia’s momentary loss of diplomatic clout created the necessary political momentum. In 1997 in talks with the United States, Russia agreed under pressure to the deployment of theater missile defenses on the condition that they were not to be used against the other side. Russia expected to preserve the core of the Anti-Ballistic Missile (ABM) Treaty in return, but the United States withdrew from that treaty in 2002 to complete development of a new generation of systems aimed at intercepting intercontinental ballistic missiles (ICBMs). The 1999 National Missile Defense Act called for the United States to deploy “an effective national missile defense system capable of defending the territory of the United States against limited ballistic missile attack.” At that time, the stated level of ambition was modest, emphasizing technical improvements to theater missile defenses over advancing territorial systems. Progress was achieved on the theater systems while technical success was more elusive for new systems directed against key strategic threats, such as the emerging long-range missile capabilities of Iran and North Korea. Still, President George W. Bush’s declared goal in 2002 to deploy a homeland missile defense “within two years” did not reflect the actual performance of available technology, such as the Ground-Based Midcourse Defense (GMD) system. That system, which was fielded with untested prototype kill vehicles that suffered malfunctions, is an illustration of the dissonance between political and technological timelines. As of 2017, the GMD program has cost roughly $40 billion, and the Department of Defense assesses that the reliability and availability of the ground-based interceptor missiles remain low. The official narrative on missile defense programs is a subtle mix between the call for staying ahead of the threat by attempting to capitalize on continuous technological progress, the permanent need to secure funding, and an acknowledgment of the limited effectiveness of fielded systems. As a result, the U.S. posture may seem to fluctuate greatly over short periods of time, sometimes sowing confusion among allies. In Europe, for example, U.S. missile defense projects were first aimed at protecting the United States against a future Iranian ICBM threat. That shifted to the European Phased Adaptive Approach, as the Obama administration’s missile defense policy in Europe is formally known, to defend NATO’s European territory against a salvo of Iranian shorter-range missiles. Yet for several European countries, the phased adaptive approach was primarily relevant as a symbol of U.S. political assurances against Russia, an issue unrelated to the ballistic threat it was meant to tackle.2 Although the United States clarified that Russia was not a target, the uncertainty surrounding the final shape of the system fueled a debate about whether it posed a potential threat to Russia’s strategic capabilities, a situation that Moscow used as a pretext to justify its own military buildup in Europe. Recent developments will add more uncertainty regarding U.S. intentions. The 2017 National Defense Authorization Act, although enhancing the “stabilizing benefits” of missile defense, calls for the establishment of a “robust layered missile defense system” capable of defending against the “increasingly complex” missile threat. Sen. John McCain (R-Ariz.) in February 2017 proposed the development of new types of defenses while other lawmakers urged increasing the number of GMD interceptors and initiating a space-based missile defense program. Analysts argue that the vocabulary used in the authorization act is in line with previous documents, the absence of the term “limited” paves the way for more ambitious objectives. The new ballistic missile defense review likely will echo this call for more action. Further progress is necessary before ballistic missile defense can be considered a strategic game-changer from the perspective of the defender. Yet, predictions of such technological breakthroughs are credible with certain caveats, suggesting the potential for limited protection against Russian and Chinese missiles. As the latest North Korean launches of the ICBM-range Hwasong-14 missile demonstrate, the spread of offensive capabilities in third countries will trigger a legitimate debate on the need for more advanced defenses. Approximately 30 countries possess ballistic missiles, and more countries in the Middle East and Asia will acquire them. In the meantime, progress on specific systems, such as the Terminal High Altitude Area Defense (THAAD) system, create the reassuring impression among the public that missile defense may nullify the risk of an attack. It provides a long-awaited political justification for the $123 billion invested by the Missile Defense Agency in the missile defense sector since 2002 and even opens the perspective of a return on investment through exports. In fact, as the perceived threat grows, the United States holds a quasi-monopoly position on a potential $23 billion global market.3 These factors seem to call for a more ambitious missile defense policy that would involve interception capabilities against advanced systems and would seek to offset its costs through a more aggressive export policy. Such a policy, of course, comes at a price. The creation of a global missile defense network implies agreements with hosts for forward-based sensors and interceptors, which generates new liabilities and commitments toward third states on the periphery of the traditional U.S. areas of influence. It raises the issue of defending new critical assets, especially radars, located on allied territories, which are more vulnerable to preventive destruction. For example, Russia threatened to destroy fixed ballistic missile defense assets assigned to NATO in Poland, Romania, and Turkey. In a crisis, it is not clear that all hosting states would accept responsibility for systems they do not supervise, such as in South Korea, or when the bilateral relationship is tense, as with Turkey. Eventually, such a global network could reduce the U.S. political margin of maneuverability in a conflict instead of improving it. The economic factor also may drive missile defense programs in a direction inconsistent with U.S. long-term strategic interests. First, the export-driven approach, which favors off-the-shelf acquisitions, has a mixed impact on the resilience of U.S. allies. For limited defense budgets, the acquisition of costly missile defense systems may come at the expense of more cost-efficient reforms in other sectors and put an end to the development of indigenous capabilities, as has been the case in Europe. It also will diffuse sensitive technologies among a much broader range of business partners while prompting adversaries of these countries to invest even more in offensive capabilities so as to overwhelm their defenses. As a result, the missile threat could grow rather than diminish, but proponents argue that more effective and numerous defensive systems could compensate for this. In the longer run, a policy to develop interception capabilities against advanced systems could have an impact on strategic stability and crisis stability. Concerns expressed by China and Russia that U.S. missile defenses already undermine strategic stability are far-fetched. Their views are mostly unrelated to current deployment but nurtured by an insecure view of the future, including extreme interpretation of projections that in 2030 the United States could possess 350 to 550 missiles4 on Aegis ships with enhanced detection and interception capacities. In theory, missile defenses coupled with continued investment in conventional long-range, precision-strike capabilities could help disable significant portions of an adversary’s arsenal during a first strike while complicating retaliation, with the consequence of increasing the risk of escalation to early use of nuclear weapons. Russian Foreign Minister Sergey Lavrov’s 2008 statement that “it is most likely that in the foreseeable future we will hear of hundreds and even thousands of interceptor missiles in various parts of the world, including Europe,”5 indicates that such concerns, although exaggerated, are real. This is a reminder that, on the international stage, mutual confidence matters as much as observable facts. A U.S. breakthrough might ideally create an important rift between the major rival powers and aspiring competitors. It could complicate the efforts of potential adversaries to keep U.S. territory or forces under the threat of a missile strike. Regional powers, such as Iran and North Korea, would not give up their programs because they consider ballistic missile capabilities a political guarantee against regime change. However, they would be forced to devote far more of their limited resources to countering missile defenses with decoys or increased maneuverability while less advanced proliferators may abandon ballistic missile ambitions to focus instead on cheaper, asymmetric strategies. Such tactical achievements, even if limited and temporary, will be used in the United States to dismiss any restraint on missile defenses as counterproductive. Yet, efforts to obtain a capability to reliably shoot down advanced ballistic missiles would almost certainly trigger a renewed arms race with the greatest powers. It would not only increase the risks of a misunderstanding, but also justify a surge in modernized nuclear stockpiles and delivery systems, harming prospects for nuclear disarmament. Potential adversaries would use an ambitious U.S. missile defense policy as a pretext to infringe on existing multilateral regimes if they believe that such accords will eventually become obsolete anyway due to technologically driven developments. For instance, this could be used by Russia to justify formal withdrawal from the Intermediate-Range Nuclear Forces Treaty and deployment of more short-range ballistic missiles in Kaliningrad. For the same reasons, an increased level of ambition for missile defense programs would harm the prospects for U.S.-Russian talks on strategic stability. Instead, a competition on missile defense systems accompanied by a diversification of offensive arsenals would encourage new, therefore unstable weapons concepts and doctrines, fueling the risk of misunderstanding. Russia’s delivery of the advanced S-300 air defense systems to Iran and Russian efforts to field S-400 area defense capabilities against air and missile threats have spread alarm within NATO, worried that anti-access/area denial capabilities might give Russia tactical superiority in disputed areas, such as the Baltic Sea, Black Sea, and Syria. Notably, these concerns have been high in peacetime, a period during which Russia never activated them against NATO assets. This suggests that any U.S. sense that relying more on missile defenses will lead to increased stability and security could vanish as China and Russia also invest in this sector and start implementing similar strategies. For two decades, the United States chose to reinforce and expand missile defenses as new needs arise while ensuring the modernization of nuclear arsenals to maintain the credibility of nuclear deterrence. As missile defenses gain the power to shape the strategic environment, it is worth examining policy options for the United States and its allies. There are ways to defuse some of the risks associated with missile defense development without changing the existing framework. Currently, only minimal deconfliction efforts are pursued, primarily through public emphasis on the limited aim of missile defense systems. In this regard, NATO summit statements offer remarkable examples of unilateral transparency. More concrete verification measures could be proposed to monitor territorial ballistic missile defense sites, such as Aegis Ashore in Romania, but such steps could backfire because they would be deemed intrusive6 and of limited effectiveness. The United States and Russia could agree on prohibiting the deployment of theater systems in certain areas under shared control or restrain their coverage when these assets overlap foreign territories. Yet in the longer run, none of these measures would prevent missile defenses from generating an arms race. A different policy could be pursued by abandoning the perception that missile defenses may not be subject to arms control talks. After all, it was a pillar of such talks until the 1990s. Advertising restraint, however, is not an easy task because the United States and U.S. allies have hinted at missile defenses as the best security assurance possible and a quasi-deterrent against potentially hostile powers such as Iran, North Korea, and even Russia. Yet, recent developments in Northeast Asia, where missile overflights of Japan tamper high expectations that such systems could act as a deterrent, would weigh in the debate. An important goal is to prevent too many actors from joining the club of missile-defensible states. To begin with, sensitive technologies associated with missile defenses, for example hit-to-kill vehicles, should be placed under closer scrutiny. Moreover, rather than aggressively promoting off-the-shelf procurement, the United States could support indigenous missile defense development efforts among their most skilled partners only, in exchange for a bilateral commitment not to re-export them. In the meantime, the United States would insist on China and Russia taking responsibility in curbing missile proliferation. North Korea’s demonstration that it possesses an ICBM capability complicates the equation. Still, China and Russia have some leverage on North Korea. In return for effective action on their side, the United States should let the door open to a rollback on deployed systems, in particular the THAAD system in South Korea, if the threat were suppressed. The United States, China, and Russia could also explore capping territorial missile defense development according to missile threat evolution, but this would require coordinated monitoring efforts of proliferating states. The perception by some allies that missile defenses are a symbol of the U.S. commitment to protect their territory further complicates matters. Yet, the need for reassurance in Europe mostly stems from Russia’s attempt to bully its neighbors into submission in the Baltic region. If Russia wishes to avoid the future establishment of an Aegis Ashore site in Poland, it should offer to decrease its military posture in Kaliningrad and the Black Sea significantly; Poland could still host U.S. personnel and equipment for security reasons. At the alliance level, this asymmetric bargain could compensate for the very limited loss of protection against an Iranian threat. It could be cancelled if Russia failed to dissuade Iran from significantly augmenting the range of its missiles. At present, the notion of capping missile defense development is not being explored by the United States, in part on dubious grounds that missile defense activity is morally legitimate. Such an assertion is not justified in theory, nor is it effective in practice. Although primarily a defensive concept, missile defenses support offensive missions on the theater level and shapes the evolution of other powers’ deterrence strategies to an extent. Moreover, it is a powerful diplomatic irritant, which makes it a strong bargaining chip in any negotiation. It is uncertain what price China and Russia would pay to cap U.S. missile defense development. Their willingness to pay a high price may decline over time because both countries are becoming increasingly efficient themselves in this emerging domain. Hence, it is not certain that time will always be an asset for the United States, especially as China’s funding potential grows. Yet, the immediate interest for China and Russia is to negotiate in good faith. A refusal on their part to engage in serious discussions would discredit their narrative about a U.S. military buildup in their respective regions. Additionally, China and Russia would benefit from negotiating because a strategic arms race on missile defenses would risk disrupting China’s deterrence strategy and would certainly strain Russia’s economic capabilities. With the United States, China, and Russia on board, this club would have the critical mass to diffuse good practices to the entire international community, mitigating the potentially destabilizing consequences of missile defense development. 1. “Report of the Commission to Assess the Ballistic Missile Threat to the United States,” 1998, https://fas.org/irp/threat/missile/rumsfeld/toc.htm. 2. “[Polish and Czech] goals were political, having nothing to do with Iran and everything with Russia; the US deployments on their soil would be a concrete manifestation of US security guarantees against Russia beyond our commitment under the NATO treaty.” Robert M. Gates, Duty: Memoirs of a Secretary at War (New York: Alfred A. Knopf, 2014), p. 403. 3. Strategic Defense Intelligence, “The Global Missiles and Missile Defense Systems Market 2015-2025,” March 2017, https://www.reportlinker.com/p03605945/The-Global-Missiles-and-Missile-Defense-Systems-Market-Major-Programs-Market-Profile.html?. 4. George Lewis, “Strategic Capabilities of SM-3 Block IIA Interceptors,” Mostlymissiledefense.com, June 2016, https://mostlymissiledefense.com/2016/06/30/strategic-capabilities-of-sm-3-block-iia-interceptors-june-30-2016/. 5. Interview with Russian Foreign Minister Sergey Lavrov, Gazeta Wyborcza, February 7, 2008. 6. For example, monitoring the Aegis Ashore MK-41 platform would probably involve an in-depth investigation of the tubes and software involved. Boris Toucas is a visiting fellow with the Europe Program at the Center for Strategic and International Studies, expressing personal views. Previously, he served in the nuclear nonproliferation and disarmament office at the French Ministry of Foreign Affairs from 2013 to 2016 and was responsible for nuclear deterrence and ballistic missile defense as a member of the negotiating team during the NATO summit in Warsaw. Thomas A. Halsted, one of the early leaders of the Arms Control Association and a veteran of the U.S. Arms Control and Disarmament Agency (ACDA) in the 1970s, died of cancer on Oct. 7 in Gloucester, Massachusetts. He was 83. Halsted was hired as the first executive director of the Arms Control Association shortly after its founding in 1971. He established the organization's role as a key source of information and analysis on the nuclear arms control and nonproliferation and launched the Arms Control Association Newsletter, which would later become Arms Control Today (ACT). After serving in the U.S. Army from 1954 until 1961, Halsted worked in the State Department’s Bureau of Intelligence and Research and later at ACDA. He served for four years as the Council for a Livable World’s national director before he joined the staff of Sen. Alan Cranston (D-Calif.) as a legislative assistant. how to slow and reverse the U.S.-Soviet nuclear arms race and curb the spread of nuclear weapons. With Halsted at the helm, the association held workshops and briefings for reporters and congressional staff and published analyses and commentaries on the 1972 Strategic Arms Limitation Talks (SALT); controversial, new strategic nuclear weapons systems such as the B-1 bomber and the proposed MX missile; and the newly in-force nuclear Nonproliferation Treaty (NPT). Writing on behalf of the organization that year, Halsted deplored the long delay in achieving concrete results and called for follow-on negotiations to take on additional issues. He called for “a moratorium on further qualitative and quantitative strategic weapons construction,” an immediate halt to all nuclear testing while negotiations on a comprehensive nuclear test ban treaty were pursued, and limits on ballistic missile flight testing to inhibit the development of multiple, independently targetable re-entry vehicles (MIRVs). He would later write in Arms Control Today that the 1974 Threshold Test Ban Treaty, which banned nuclear explosions with yields larger than 150 kilotons TNT equivalent, “dealt a serious setback to the cause of non-proliferation of nuclear weapons” because it “permits continued testing of most of the weapons each side is likely to want to develop in the future” and failed to outlaw so-called peaceful nuclear explosions. “We live in a world of mutual deterrence. Both sides have so many nuclear weapons that if one side were to use them that would insure its own destruction. This deterrence works at many levels and it would work at much lower levels of nuclear arms than both sides have today,” Halsted told The Washington Post in February 1977. Four decades later, we still live in a world of mutual deterrence and in a world in which there are still far too many nuclear weapons and too many risks than are acceptable. Halsted is survived by Joy, his wife of 62 years; his son Tom; daughter Beth Paddock; four grandchildren; and three siblings, Nell Moore, Charles Halsted, and Bella Halsted. The Arms Control Association family, including current and former staff members, interns, members of the board, and Arms Control Today contributors, will miss our friend Tom Halsted and appreciate the legacy of arms control and disarmament education and advocacy he created. Nobel committee said the group gave “new vigor” to efforts to achieve a world without nuclear weapons. The International Campaign to Abolish Nuclear Weapons (ICAN) was awarded the 2017 Nobel Peace Prize for its long-standing work to call attention to the catastrophic humanitarian consequences of nuclear weapons use and its integral role in the adoption of the landmark Treaty on the Prohibition of Nuclear Weapons. “It is the firm conviction of the Norwegian Nobel Committee that ICAN, more than anyone else, has in the past year given the efforts to achieve a world without nuclear weapons a new direction and new vigor,” the Norwegian Nobel Prize Committee stated. “[T]he courage it took for a bunch of activists to pursue an idea through to international law, despite being stripped of funding and at times dignity, and the courage it took for 122 governments to stand up to the power of the bomb wielded by a handful of aggressive, warmongering governments, is what reflects the best of humanity and the most promise for our future as a species,” wrote Ray Acheson, director of Reaching Critical Will and a member of the ICAN steering committee, in an Oct. 9 editorial. Japan, while opposing the prohibition treaty despite the hibakusha’s central role in advocating for it, welcomed the increased awareness of disarmament and nonproliferation that could result from the prize. “Although ICAN’s activities to date are different from the Japanese government’s approach, we share the goal of eliminating nuclear weapons,” Japanese Foreign Ministry Press Secretary Norio Maruyama said in an Oct. 8 statement. ICAN drew congratulatory comments from representatives of dozens of states meeting in the UN General Assembly First Committee, from countries that attended the nuclear prohibition treaty negotiations to a few that had boycotted them. All nuclear-armed states and most NATO members boycotted the prohibition treaty negotiations, meaning the accord will have little immediate impact on existing nuclear arsenals. (See ACT, November 2016.) The Nobel committee acknowledged that the treaty will not “in itself eliminate a single nuclear weapon,” but said that it does fill a “legal gap” as the first prohibition of nuclear weapons. The award not only is prestigious recognition of ICAN, but also is intended to be what the Nobel committee said is a “call” on nuclear-armed states in particular to begin “serious negotiations” to eliminate nuclear weapons. “I therefore hope this prize serves to inspire new momentum, dialogue and serious efforts by the international community to pursue disarmament as a means for preventing conflict, reducing international tensions and achieving sustainable peace and security,” said UN High Representative for Disarmament Izumi Nakamitsu in an Oct. 6 statement. For its part, ICAN intends to use the Nobel Prize to achieve greater treaty adherence. “We hope the Nobel Prize will help us in our campaigning to get countries to sign and ratify this vital agreement,” Tim Wright, campaign director of ICAN Australia, said at an Oct. 9 press conference.